The City Plaza is a hotel located in the heart of Athens. It was a symbol of the Greek crisis. For years it was closed. Today, City Plaza is open again and fully occupied. The new guests come from around the world: from Syria, Iraq, Pakistan, Iran and Afghanistan. These current occupants of the hotel came with no belongings and do not need to pay. They all fled from their homes, and many belong to those 50,000 desperate individuals who are currently stranded in Greece, in no-man’s-land and disastrous camps, because fenced-off Europe has shut them out. At City Plaza, refugees find a place that allows for privacy, in an atmosphere of security and dignity. This is true for all 400 guests of the hotel, but in particular for the 185 children among them. The hotel was occupied in April by an activist group. Together with the refugees many people in solidarity now manage the daily life in the hotel. There is no support from the state. But there are good food, clean hallways, a pharmacy, a hairdresser, as well as language courses, a library and legal support. Everything is maintained on a voluntary basis and supported through donations. And all decisions are made collectively. 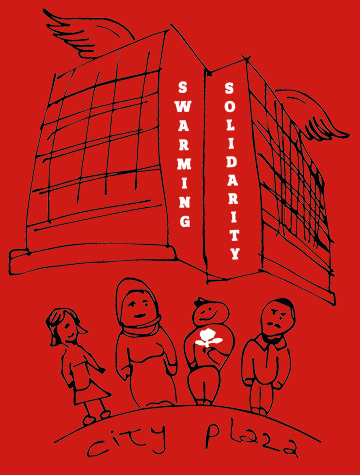 “We live together – solidarity will win” is the motto of the City Plaza Hotel. The hotel demonstrates every day anew that even in a situation of crisis and poverty it is possible to welcome people with open arms and to create dignified living conditions for all. To that end, the refugees in the hotel need further support: for 1000 meals a day, medicine, for school materials and many other things. And, first and foremost, in order to be and remain a political example: The City Plaza Hotel is a place of equality and solidarity, the lived antithesis to Fortress Europe and its borders of shame. It is a symbol of hope. Or simply: City Plaza is the best hotel in Europe. Check out the new campaign "Keep City Plaza Open"!